Soviet Russia in the years 1921-1923 saw the ending of the civil war fighting. As the Red Army moved on to a peace footing, its leader, Leon Trotsky, fought to prepare it for new tasks, in a period in which the destiny of the Russian Revolution was closely bound up with the development of the working class internationally. It was a time for study, for training and for drawing the lessons of the Army’s first years. In these years, Trotsky says, the history of the Red Army was in large part the history of the working class itself. The analysis he makes in this, the fourth of the five-volume series, is a major contribution to present-day knowledge of the Russian Revolution. 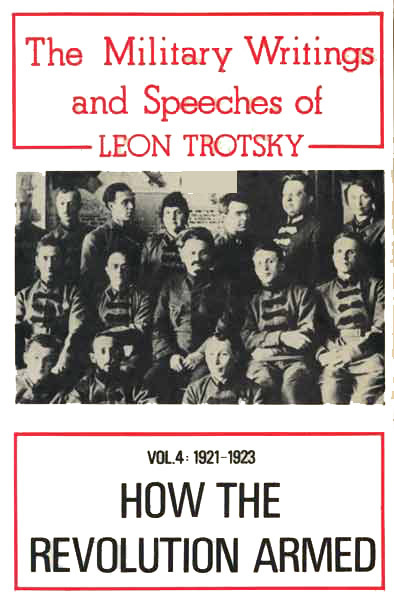 Suppressed for decades in the Soviet Union, Trotsky’s military writings and speeches are here published in English for the first time. Source: Materials and Documents on the History of the Red Army, The Military Writings and Speeches of Leon Trotsky How the Revolution Armed, Volume IV: The Years 1921-23, New Park Publications, London, permission for publication on the Trotsky Internet Archive given by holders of the copyright, Index Books, London. Translated (and edited) and Annotated: Brian Pearce for New Park Publications. Online Version: Leon Trotsky Internet Archive, 2003. Not One Week, but Fifty-Two Weeks! It is Necessary to Learn to Write! Alas, We are not Accurate Enough! 2. Orders, Circulars, Telegrams, etc. Order by the Chairman of the Revolutionary War Council of the Republic, September 11, 1921, No.263. More Care for the Disabled of the Civil War! Greetings to a Glorious Division! Order by the Chairman of the Revolutionary War Council of the Republic, October 24, 1922, No.273. The Supplementary Call-up of the 1901 Class has been Completed! Order by the Revolutionary War Council of the Republic, February 11, 1922, No.365. Fraternal Thanks!